After Campbell had visited Germany, and met the Irish exiles who had inspired his " Exile of Erin," he returned to London, and thence to Scotland. In Edinburgh he was arrested for high treason, on suspicion of complicity with the Irish exiles. His trunk was seized, but the search through its contents, instead of bringing to light treasonable papers, revealed the first draft of "Ye Mariners of England," which of course amply vindicated his loyalty. The music of " Ye Gentlemen of England" was composed by John Wall Callcott, who was born at Kensington, England, in 1766. He early developed a fondness for music, and when thirteen years old he attempted composition, and wrote pieces for a private play. He sent one hundred original compositions to compete for a prize offered by the Noble�man's Catch Club. When the club decided to accept but three pieces of a sort, Callcott sent twelve, four of which gained the four medals. By himself he studied French, Italian, Hebrew, and Syriac. He became joint organist of St. Paul's, Covent Garden, and studied instrumental music with Haydn. Dr. Callcott began to compile a musical dictionary, and while proceeding with it, formed a military band for which he composed and arranged the ■ music, and personally drilled the performers. He also wrote a musical grammar. For fifteen years before his death, which took place May 15,1821, his mind was deranged. 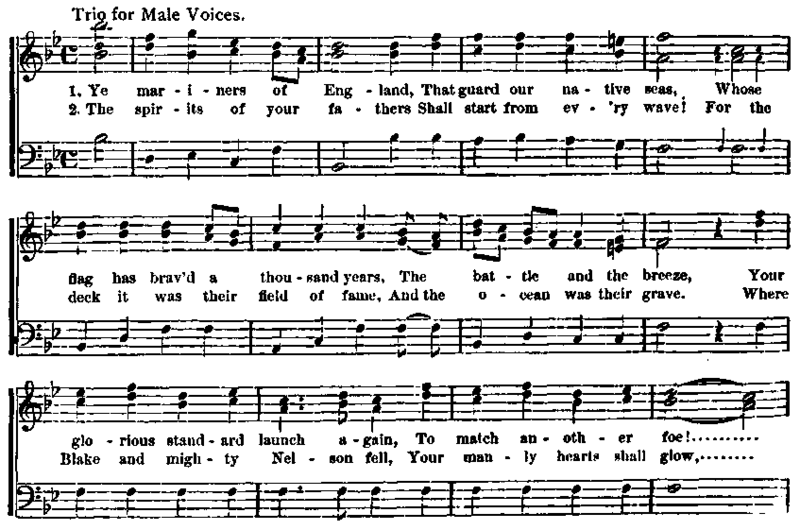 The music of the song is arranged as a trio for men's voices.